Give those around you affected by bladder cancer hope, strength, faith and courage each time you wear this Cure Bladder Cancer Awareness T-Shirt. This eye catching design is sure to get you noticed and will help spread awareness wherever you go. Help show support for the cause and spread awareness today with our encouraging Bladder Cancer Shirt so one day we will find a cure. Our Personalized Bladder Cancer Shirt for Awareness is available on our premium 100% cotton T-Shirt, machine washable in youth sizes XS-L and adult sizes S-3XL. Includes FREE Personalization! Personalized your Awareness Shirt for Bladder Cancer with any three line custom message on the back. With Bladder Cancer being under-recognized and under-funded, you can help spread the awareness and help raise money with MyWalkGear.com. Take a look at our ever growing collection of Personalized Bladder Cancer Awareness Shirts and Walk Gear to show your support today. 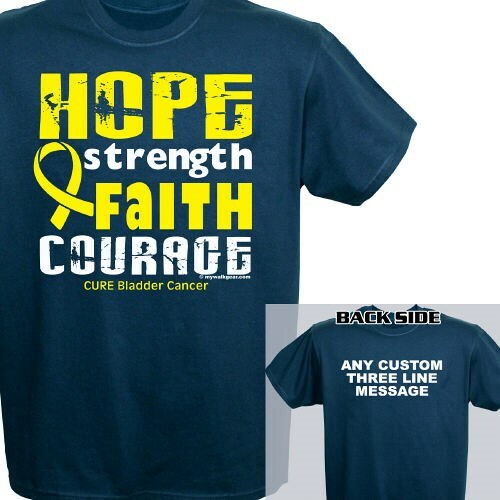 Walk in style with this Bladder Cancer Awareness Shirt or our funny Screw Bladder Cancer Awareness T-Shirt to bring an uplifting atmosphere at your next awareness walk. Be sure to also take a look at our Cure Bladder Cancer Awareness Key Chain to show your support every day.